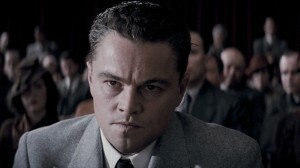 Leonardo DiCaprio (Shutter Island) portrays former FBI hear J. Edgar Hoover in this biography film, directed by Clint Eastwood (Hereafter). As Hoover dictates the course of his career and his building of the FBI to junior agent after junior agent, he remembers his life, the good and bad: his domineering mother (Judi Dench, Jane Eyre), his attempt at a relationship with his secretary (Naomi Watts, Fair Game) and his long-time relationship with his number two agent (Armie Hammer, The Social Network). The R-rated movie, which also features Dermot Mulroney (Jolene), Lea Thomspon (Back to the Future) and Josh Lucas (Daydream Nation), grossed $35.7 million when it was in theaters. It’s a respectable domestic gross and in line with Eastwood’s most recent films but far lower than his older titles, such as Gran Torino ($148 million) and Million Dollar Baby ($100 million). The Blu-ray/DVD Combo includes instant streaming of the film with UltraViolet Digital Copy, redeemable before Feb. 21, 2014.